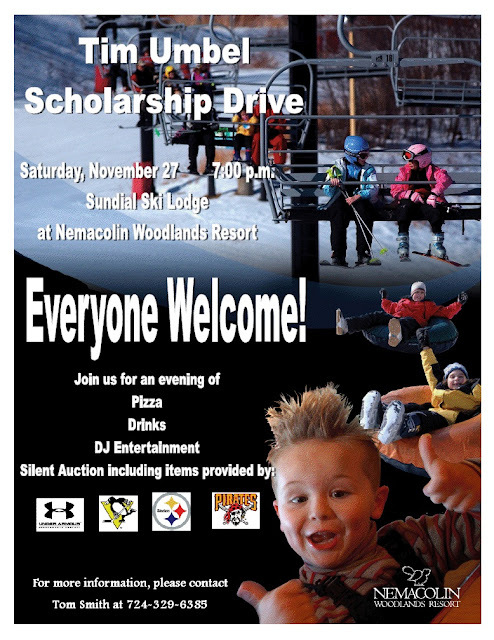 This weekend, I'll be venturing to the palatial location of Nemacolin Woodlands Resort for the annual Tim Umbel Scholarship Auction, to be held Saturday night at 7 PM at their Sundial Ski Lodge. This was a tremendously fun event to participate in last year, and I'm really looking forward to this Saturday's festivities. There will be ample food and drink, a DJ, TVs showing all the big games of the night, and an enormous silent auction loaded with signed memorabilia from your Pittsburgh sports heroes, with proceeds benefiting the Tim Umbel Scholarship Fund. I can assure you that this is not a boring, buttoned-down, black-tie auction. It's a really fun, young crowd and a great atmosphere, with items up for bidding that will fit everyone's budget. I'm especially counting on our sizable Fayette County contingent to drop by. Admission is free, so if you're available, please join us for a few hours on Saturday in the name of a very good cause. i love your blog and read it every day - i now live near lancaster pa, so your blog is my main source of pittsburgh news :) thanks for sharing about the scholarship drive - timmy umbel and i went to the same small high school. hope it goes well! Is that a young Philip Rivers on the bottom right?